Discussion in 'The Lightweights' started by Dontevenguess93, May 10, 2014. I know you guys think anyone that loses by TKO has no chin. But does that dude have sick ground and pound or what? I don't think Barry's chin is bad. And lmao at y'all's logic. 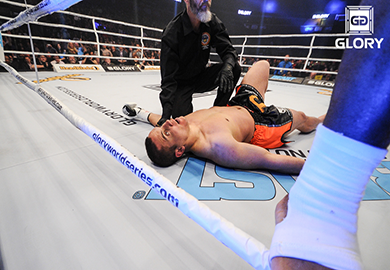 He got knocked out by a haymaker in a glory kickboxing match... Yep that concludes he chinless. You guys are too funny. Yes Pat Barry's chin is still shot. Well he did just get knocked out cold in a kickboxing bout. Pat Barry is still NOT a good fighter. I love me some HD, but Chins do not come back. Once they're gone....well you know. Putts maybe even more chinless than he is. But how many men with chins would've survived those punches anyway? He goes out cold immediately. Most guys would probably be rocked or dropped, Barry flat out looked like a dead fish. I literally get a kick from these morons. Their evidence is based on him getting KO'd by a punch from downtown in a pro kickboxing bout. His chin has been suspect the latter half of his pro-career. Not only that, every loss he has on his record has been a result of him being finished...KO or submission... he's been finished seven times, he has finished seven opponents. I think the recent Glory bout is important as he was flattened in the opening, he was steam rolled from the outset, and it was against a lighter opponent with thicker gloves than in MMA. If Barry is roughly 1 - 1 in Glory, and 8 -7 in MMA, and has been finished in every defeat, it does not bode well for any argument to the contrary. So with that being your evidence... Next week we can say everyone that's gets knocked out tonight is chinless as well?